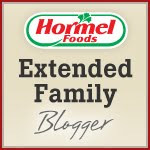 October's Hormel questions ask about quick fall meals. How do you take October activities--Halloween prep, apple picking, visiting the corn maze or hay rides, pumpkin picking--and bring it into the kitchen? When your schedule gets busy, as it inevitably does in the fall, how do you stay on top of having dinner each night? Now, for those of you that have been following along, we moved from Dallas to Colorado at the end of September, then spent the first half of October living in a hotel while we waited for our house to be done. Quick, easy meals were imperative, especially since I didn't have access to a full kitchen. Perfect for fall days, I'm still in love with my crockpot! I actually have 3--a mini one, a taller round one and a wider oval one, for different uses. On MomTrends, I shared two of my favorite crockpot recipes already (crockpot roast chicken and crockpot lasagna). I also love to default to stews and soups in the crockpot. Beef stew is extra easy--cook the beef quickly in a pan to brown it, drain, add it plus water, bouillon, potatoes and mixed veggies to a crockpot, then cook on low all day long. The next two nights are crockpot nights for us too! Tonight, I have a Hormel Always Tender Pork Loin in the crockpot. It's been simmering all day with garlic and parmesan (which you can smell the minute you walk through our front door). We'll serve it with steamed rice and steamed veggies, so little extra work on my part and it's pretty much ready to eat by 6pm! 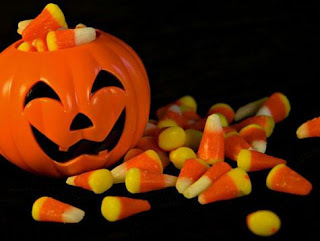 Tomorrow, for Halloween, we're having friends over for chili in the crockpot, then out trick or treating with our kids! Another meal I don't have to watch carefully all day long, since I need to be at F&B's school in the mid afternoon. What are your favorite fall meals? Or crock pot meals? Leave me a comment with your favorite, and one random winner will receive a pumpkin trick or treat basket, filled with Hormel goodies! Mmm my favorite fall meal is pork loin roasted in the oven with apples, onions, and sweet potatoes. It is so delicious! Anything involving apples and sweet potato screams fall in our house. I love to use my crockpot too. My family loves bbq chicken, roasts and chicken noodle soup. I've been cooking up a storm with pumpkin this year - made Pumpkin Empanadas, Pumpkin soup and Pumpkin pie cupcakes. My faaaaaavorite crockpot meat is Pepperocini Beef.. It is absolutely delicious! My favorite fall meal is probably chicken and dumplings. I don't always do it in the crockpot, but it can easily be done that way and there are a lot of shortcuts you can take to make it quick. I also recently experimented with a white chicken chili (mixed reviews from the fam, sadly). Tomorrow night I'm making an easy soup using a bean & veggie pasta mix and some sausage! I am loving my crockpot lately. I think my favorite fall meal, other than Thanksgiving of course, is stew! I think my two favorite fall meals are stews and chili. Yum, Yum!! I also just made a Hormel pork roast in the crock pot and it was delicious! I simply rubbed it with salt, pepper and fresh garlic and then served it shredded with fried corn tortillas, with peach and mango salsa. My favorite Crock Pot meal is steak tacos. I let the meat and spices cook all day and pull apart the meat before serving. I usually end up eating the leftovers all week (with no complaints). People have never been in more of a rush than they are these days. With wireless communication, the Internet, and increasingly demanding professional and personal lives, there just aren't enough hours in the day. These time demands can make achieving those goals seem impossible for someone who is trying to eat a healthy diet to lose weight, gain muscle, and get into the best physical shape. After all, to eat a healthy, nutritious diet and work out regularly, you have to set aside some time. It can be difficult to set up the precious exercise time that you need and trying to find time to prepare nutritious meals can sometimes take a back seat. There's no way around it - if you want to get in shape, you have to eat better. If you've struggled with trying to fit healthy habits into your lifestyle, quick healthy meals are what you need to focus you limited time and energy on.